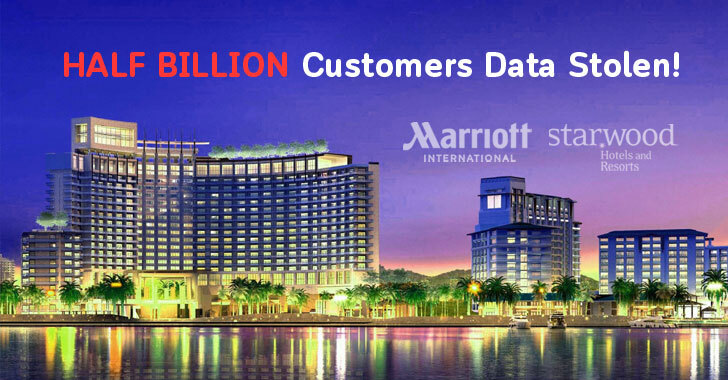 The world's biggest hotel chain Marriott International today disclosed that unknown hackers compromised guest reservation database its subsidiary Starwood hotels and walked away with personal details of about 500 million guests. The breach of Starwood properties has been happening since 2014 after an "unauthorized party" managed to gain unauthorized access to the Starwood's guest reservation database, and had copied and encrypted the information. Marriott discovered the breach on September 8 this year after it received an alert from an internal security tool "regarding an attempt to access the Starwood guest reservation database in the United States." On November 19, the investigation into the incident revealed that there was unauthorized access to the database, containing "guest information relating to reservations at Starwood properties on or before September 10, 2018." What's worrisome? For some users, stolen data also includes payment card numbers and payment card expiration dates. But, according to Marriott, "the payment card numbers were encrypted using Advanced Encryption Standard encryption (AES-128)." Attackers need two components to decrypt the payment card numbers, and "at this point, Marriott has not been able to rule out the possibility that both were taken." Since the data breach falls under European Union's General Data Protection Regulation (GDPR) rules, Marriott could face a maximum fine of 17 million pounds or 4 percent of its annual global revenue, whichever is higher, if found breaking any of these rules.